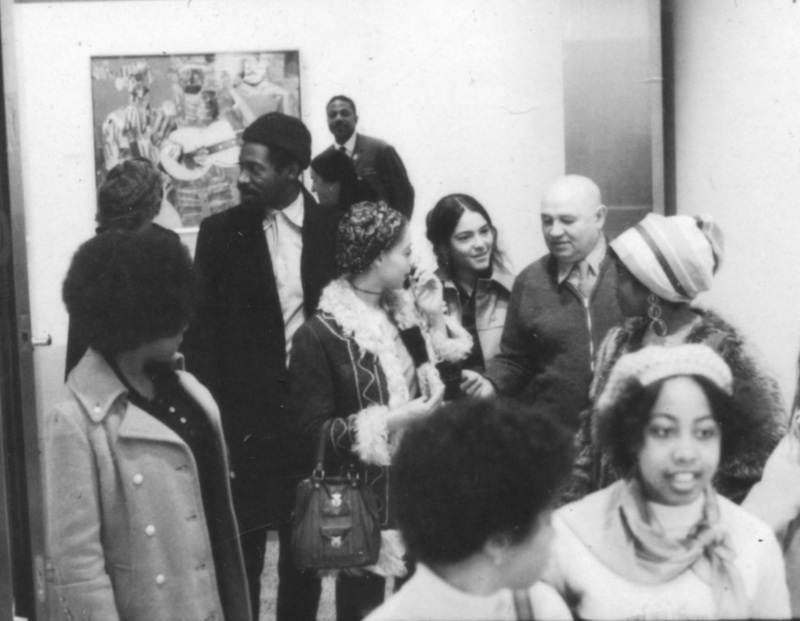 Bunch (with hat on left) accompanies Bearden (on right) to the Museum of Modern Art in 1971. Blacks and whites and grays . . .
Paradoxically, with the aid of black-and-white-and-gray photographs, Romare’s work has come to speak (now in the full chill of the computerized age, with see-through skyscrapers, interplanetary travel looming out of demystified nights, and the white frost of universal violence perverting most visions, most dreams with oddly sterilized blood); his work, after many years of “cumulative destructions and new beginnings,” orders, clarifies, and makes classic our social reality. Direct experiences . . . I will only ask the question and extend it once. What can the “direct experiences” of a painter who has been painting in White America for over thirty years be like? And what happens if he is considered “black”? faces forcing Rockets to the Moon. The Prevalence of Ritual several times. was subtitled the prevalence of ritual. consolations, consolations maybe . . .
and profound, ordinary black people. To the darkest girl child. Quietly, closed off in my part of the house, late, way back in the back of night and at the top, with just the windows slightly cracked in order to reassure any softly whistling, lone, and unseen black man walking in the shadow of the shadows outside, unseen, I remember coloring, for the thousandth time, a face, a page, a space. The record player plays . . .
Philadelphia, my art-school days in the barren City of Brotherly Love; 1961; the man’s educational system has reached a point of collapse for me or I am losing my mind. Everybody tells me I am losing my mind. The record player plays . . .
. . . to surround roving knots of young men in the flat, countrified black ghetto people in Philadelphia call “North Philly.” I had long since stopped painting really, the reality of the act of communication was words then, only rarely colors; but now, remembering --- remembering now, remembering then—I can see the forms mutely looking out at me. The faces and the forms mutely looking out at me. silky staccato south street immobile. is the ritual of man united in agony, joy, and wine. in its upholstered bass-filled belly. in live eating places, another idiot; fertile oasis rooted in hard tar. I fled from Philadelphia. I fled from myself. When I arrived in New York City I found myself filled with a bitterness, a frustration, and a cold, cold anger that was fed by the considered realization that the majority of the people and institutions, white people and white institutions in this city, the most populous, powerful, and diverse in the Western world, wanted, institutionally and spiritually, to subject and destroy me, and people like me, with their colossal collective, materialistic banalities; wanted to force upon me and my kind their brand-new advertisement of and for themselves; wanted me to accept, utterly, in my soul—that part of a man or a people that holds their father’s music, their father’s vision, their father’s art most dear—wanted somehow to force upon my spirit the agonizing contradictions of their own dehumanization, violence, and despair—as if I didn’t have my own. It was the same as Philadelphia, magnified 100 percent. The tall trees, the sky, and grass were replaced by concrete, asphalt, and steel. The human quality, isolated as it was, of Laughlin Frame Shop replaced by the mechanization of a New York City frame-factory, where artists were required to think and act like art machines, obediently creating vacuums under polished glass. The soup cans, painted plastics, women’s underwear, dog biscuits and such being seriously and soberly framed would be interrupted occasionally by a peerless so-called modern Western work of art, which was separated, locked in, and framed, airtight, in the blinkless sterile system of the American lords and priests of the “art world,” as it and they were escorted silently, antiseptically through the factory, locked within themselves. The incredible predicament I found myself in at that time can only be understood by one who has experienced, somehow, the manifold dilemmas and contradictions of a black artist, or any artist, for that matter, who finds himself surrounded by a fantastically materialistic, profoundly alienated and oppressive, memoryless white culture. And, thank God, there are many people, black and white, who have come to understand. Romare Bearden is one of these people. And that is why he is so very important. He has understood this predicament as it applies to the artist in general and to the black artist in America in particular. This understanding accounts for the tremendous shock I experienced when I first saw his work in (of all places) the frame-factory, the work of an American artist, a black artist, who understood what I had studied at the Barnes Foundation; who understood my need to return to my black cultural roots without denying what I was, what I am; who understood the interlocking nature of all truly creative traditions, from the East and the West; and, more than that, one who acted in such a simple and direct, yet beautiful and disturbing way; acted, it seemed to me then and even more now, out of understanding, in such a harmonious and compassionate way, free of hatred in a country full of hate, free of vanity in a country full of vanities. I will never forget the last day I worked at that frame-factory. I had two jobs to do, Motherwell and Bearden. The huge Motherwells were off in their frames by a fraction of an inch, and for that the black foreman fired me. But it was a startling experience, holding in my hands the paintings of an artist I did not know that expressed so much of what was in my heart and consciousness. So startling. The foreman had spoken not a word about Bearden. But Bearden himself spoke, over the din of the art-factory, across the years and time that separated me from him and him from his roots. The art of Romare Bearden, the art of the last ten years, has shown the vital relationship of American black people to Africa in a way that is most graphic; mixing, composing, creating a sea of faces and masks --- American faces, African masks ---- this art has shown the vital relationship of American black people to themselves in a way that is most illuminating; it crystallizes, with a quality at once static and moving, a profile of a man and of a people at perhaps the most decisive moment in our history; an inner profile of a people truly unique, not in their suffering alone, but in the quality of their suffering, silently for the most part, revealing a relationship that influences every aspect of American life and every aspect of the nation’s beauty and strength (---look closely, America, and tell me, quietly, who is weak and who is strong). At the Barnes Foundation I had learned to look at a painting in the same manner a scientist looks at and studies the physical world. The paradoxical Bearden. He has come to us with a reinterpretation of the Cubists; more, a reinterpretation of the source of Cubism, and a reinterpretation of America, with a shockingly simple use of the traditional that is as simple as a photograph (photograph!) yet as profound as a Benin mask, as full of strength as the towering and humble Rouault and as lyrical as Matisse in his direct use of color: a natural fusion of values as diverse as human flesh and brocade cloth, burnished mahogany and the luminosity of deep waters --- these, together with transferred (and real) values from African, American, and European sources so numerous that it would be useless to attempt to mention them all here. O Son of Spirit! My first counsel is this: Possess a pure, kindly, and radiant heart, that thine may be a sovereignty ancient, imperishable, and everlasting. That is the feeling I got from Romy’s heart, and that, I think, is the beginning of his greatness. O Son of Spirit! The best beloved of all things in my sight is Justice; turn not away therefrom if thou desirest Me, and neglect it not that I may confide in thee. By its aid thou shall see with thine own eyes and not through the eyes of others, and shall know of thine own knowledge and not through the knowledge of thy neighbor. Ponder this is in thy heart: how it behoveth thee to be. Verily justice is My gift to thee and the sign of My loving kindness. Set it then before thine eyes. Think, America, and be fair, at this time in our history how many hearts could a Romare Bearden inflame? And how many hearts can he calm and educate? In paintings he has chosen to be just, he has chosen to educate, not through great and mighty people alone but with plain, downtrodden, simple, black people. A tremendously crucial, divinely symbolic people. Although he knows more heroic black figures than any man I know, he nevertheless has chosen to bring us that which we need most in a most beautiful and profound way: his vision of his people, his vision, therefore, of all people. O Son of Spirit! Ye are my Treasury, for in you I have treasured the pearls of My mysteries and the gems of My knowledge. Guard them from the strangers amidst My servants and from the ungodly amongst My people. This Romy has done, and in so doing he has had to understand many traditions; he has had to gather many far-flung gems from those places his mind and heart have visited, all the time turning many a head away from the chrome racisms, technological madness, and stainless-steel souls that have become our domestic curse; away from the bombast of a Madison Avenue run amok; away from those things, plastic and sterile, that we are surrounding ourselves with, which can only foster plastic and sterile people. The “abode of his beloved.” Romy has traveled the roads of this country and abroad and returned (never having left) to his people. He has returned to illuminate for us visions we have lost, visions we have never had; dreams, rituals and black faces, recapturing their meanings . . .
O Son of Spirit! I created thee rich, why dost thou bring thyself down to poverty? Noble I made thee, wherewith dost thou abase thyself? … turn thy sight unto thyself, that thou mayest find Me standing within thee, mighty, powerful and self-subsisting. O Children of Men! Know ye not why We created you all from the same dust? That no one should exalt himself over the other. Ponder at all times in your hearts how ye were created. Since We have created you all from the same substance it is incumbent on you to be even as one soul, to walk with the same feet, eat with the same mouth, and dwell in the same land, that from your innermost being, by your deeds and actions, the signs of oneness and the essence of detachment may be made manifest. “Deeds and actions.” I remember rushing uptown one afternoon, late as usual, to meet Romy, finding him smiling in the light rain, his arm around a slight Japanese man, his eyes full of understanding, our own business forgotten, while he struggled with an artist from a faraway land and a language he did not know. Not for me, and, I’m sure, not for any of the reasons I would have, but purely for the joy of it, purely out of his overwhelming concern. With Romy it cannot, it could not, be different. Baha’u’llah’s words come to me now as I remember that afternoon and the two of them, beaming across at one another, chatting . . .
Who is Romy, America? Tell me.